Olive oil expert Judy Ridgway and Dr Simon Poole, an authority on the Mediterranean Diet, co-authors of the Olive Oil Diet, take an authoritative look at the science behind the headlines. Recent studies have shown that a diet based around olive oil will significantly improve your health, well-being and vitality. It will also help you maintain a healthy weight and avoid heart disease, stroke and diseases such as cancer, diabetes and dementia. With confusing messages on what to eat and what not to eat, The Olive Oil Diet combines the original ancient superfood, extra virgin olive oil, with natural, wholesome foods from the Mediterranean and beyond, to create the recipe for the healthiest and most enjoyable way to live. It is a book which makes sense of fats, health and the famous Mediterranean Diet. The Olive Oil Diet is the only diet you will ever need. It is not a diet to take up when you feel under the weather or want to lose weight and leave off when you feel better. It is a diet for life. We are very honoured to have achieved a Best in the World First Prize at the prestigious Gourmand International Book Awards 2017 – the “Oscars” of food writing as well as the Gold Diploma, OIS Health and Food Awards, 2017. The combination of these two experts — Dr. Simon Poole and Judy Ridgway — guarantees total understanding of both the nutrition science and the culinary applications around extra virgin olive oil. If you’re not already, you will be a convert to the everyday use of olive oil — for good health and great taste. After being diagnosed with cervical cancer The Olive Oil Diet came into my life at the right time and has educated and informed me as to the wonders of extra virgin olive oil and the health benefits of the Mediterranean diet. The book manages to pull off that difficult challenge of giving the science whilst still being fun to read for the non-scientist. 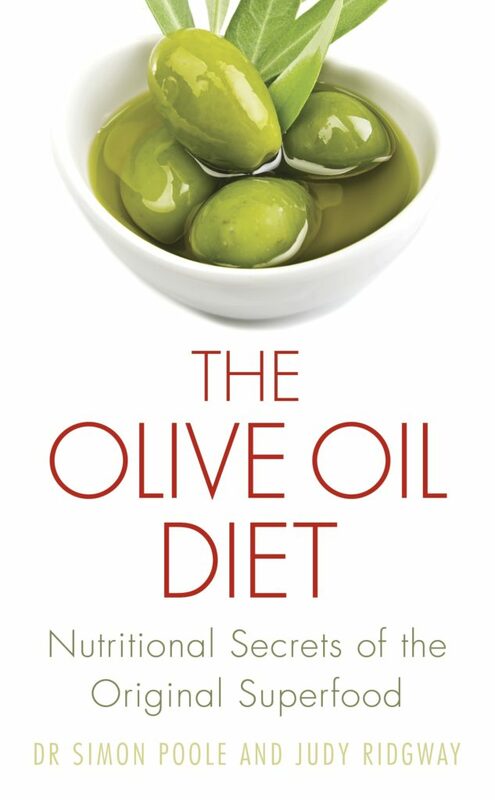 Ditching the veg oil and using olive oil is central to adopting a Med diet, and this book shows you how. A refreshing wake up call to living the way we used to do. A perfect balance between science and easy reading. Something people can read, and then base their “dieta” around. © 2016 Olive Oil Diet.